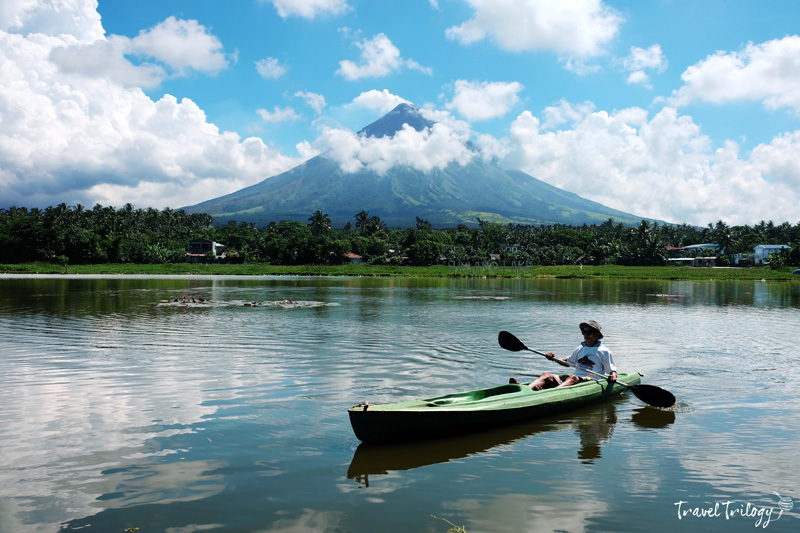 The chase to see the perfect cone-shaped splendor of Mayon Volcano begins in Camalig, Albay. Here, as your car winds through the narrow small town road, she’ll welcome you with her grandeur caressed by thin sheets of clouds. But her imposing size is too tight to admire from a roadside angle. You have to drive a little farther to see all of her grace. Don’t fret because just way past the town is a short detour to Sumlang Lake, probably the prettiest side to moon over this world-famous landmark. About a decade ago, Sumlang Lake was nothing but a huge pond of lilies & garbage. Save for some cutesy carabaos enjoying an afternoon bath, it was indeed not what you think of a lovely lakeside picnic spot. 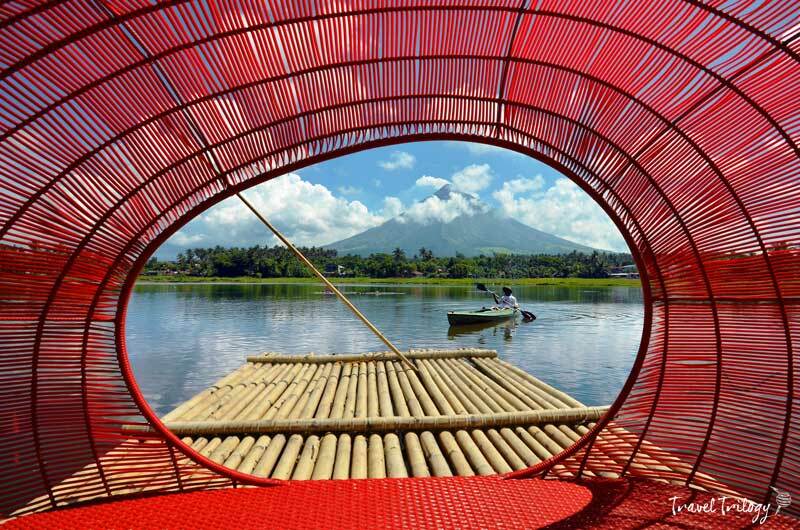 Then out from nowhere, Instagram flooded cyberspace with stunning photos of Mayon Volcano crouched by a lake & floating rafts decked with luxe furniture. It got me thinking—some marketing stunts are trying to inch out something. Whatever it was, I found my way to Camalig to check out what this buzz was all about. 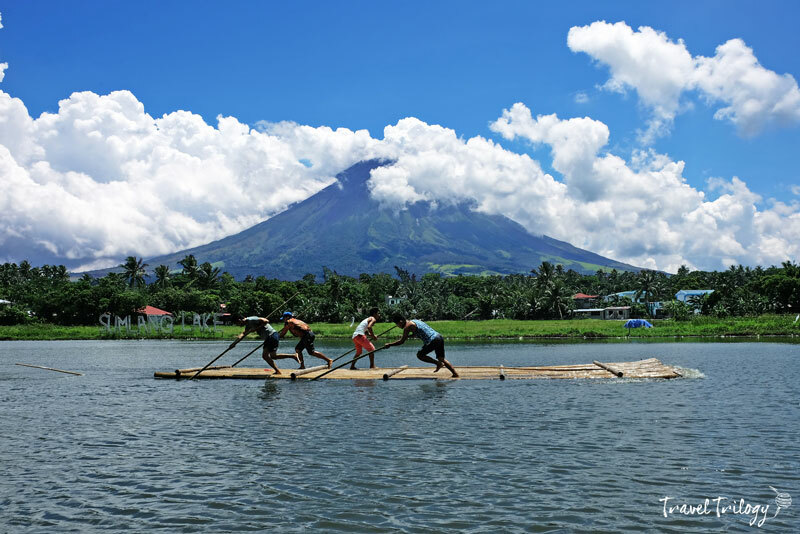 Sumlang is a 9-hectare lake in Camalig, Albay. Its rehabilitation began in 2010 through a food-for-work community program under the leadership of Barangay Captain Jun Napa. Residents were given 300 sacks of rice in exchange for community work to restore it. Today, it’s hard not to be seduced by the allure of Sumlang Lake. 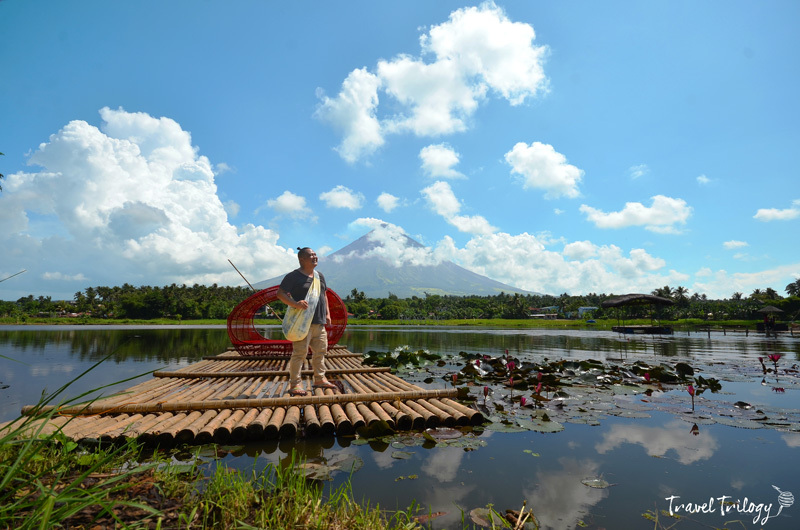 It’s sparkling clean & offers a tranquil view of Mayon Volcano. You can chill in the view deck, paddle a kayak or cruise on a raft. But what’s really attracting the crowd here especially Instagrammers is its lake tour. Aboard bamboo rafts loaded with attractive rattan & nito furniture, tourists are indulged with pretty props to their Mayon lifestyle shots. Soon, a lakeside resort fringed along its banks will be constructed to provide accommodations to tourists who wish to stay in Camalig. There’ll be more community-managed activities too like fishing, ATV rides & horseback riding. Tourism managers are also eyeing at developing agri-tourism that focuses on organic farming. Albay isn’t only known for amazing landscapes & awesome culinary traditions. It is also creating a name in outstanding craft heritage. 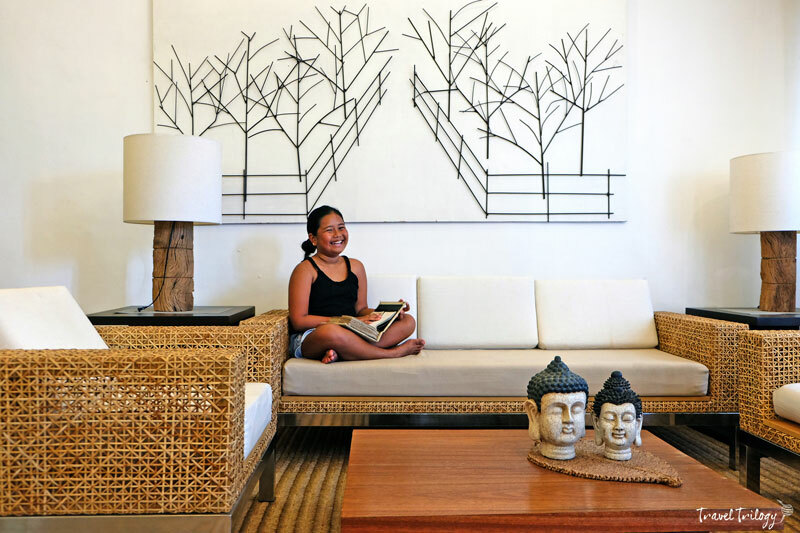 Known around the world as Natural Carpet Industries, this local company makes classy furniture made of indigenous materials such as rattan & nito. They also handcraft bags, accessories & home decors out of abaca, carpets repurposed from lilies & even stonewares from volcanic rocks. And the best part is, it’s owned by a Camalignon, manufactured & operated in Camalig & it employs local residents. 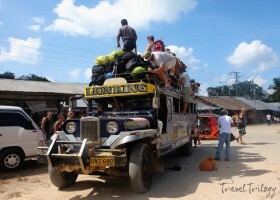 Ask anyone in Bicol for the best “pinangat” & chances are you’ll be told of one place—Camalig. Yes, foodies! 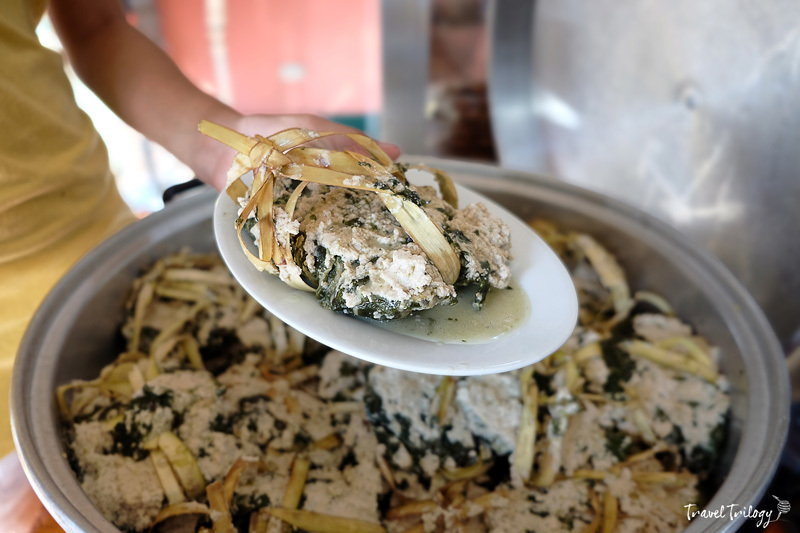 Camalig is home to the most delicious pinangat, an assemblage of tightly packed taro leaves, shrimp or fish & chili bound in coco leaves & simmered in luscious coconut milk. Let’s, Dad’s & Zeny’s are homegrown names for pinangat. They’re just by the roadside, so you won’t miss them. Camalig isn’t as popular as Legazpi or Naga. But if you pull over & explore a bit, you’ll be surprised what this small town can offer. 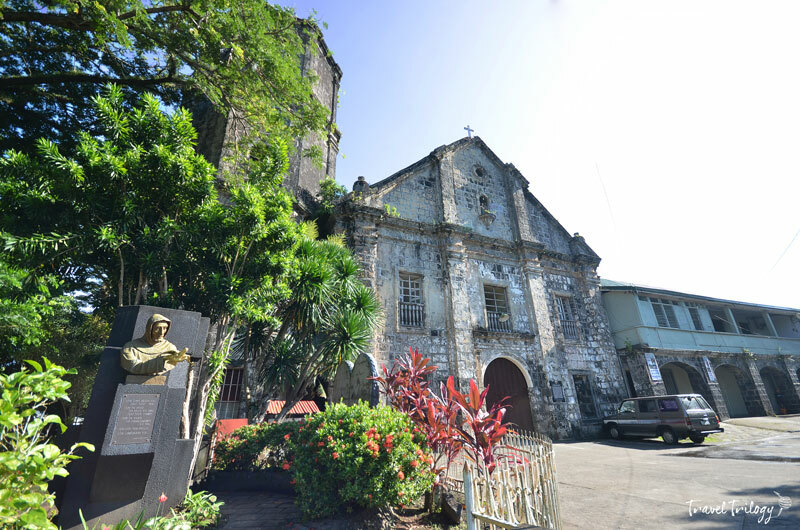 Don’t rush to Legazpi yet because other than Sumlang Lake as its star destination, it also has heritage homes & the 17th century church of St. John the Baptist. If you like to give your abs a little workout, you can go trekking in Quintinday Hills & caving in Hoyophoyopan Cave. Like it a little bare but chill? Camp out in Quituinan Hills. All the buzz about Camalig is after all true. It’s unassumingly pretty, basking on laid-back charm, delightful food memories, interesting culture & crafts, quiet but vibrant & very picturesque. Truly, it’s more than what meets the eye. 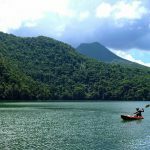 Lake Sumalang in Camalig, Albay (BICOL) is indeed beautiful, at least photographically speaking. I wonder if this place is as beautiful as in the photos. I have been to Bicol for the first time since the beginning of 2017 (January) but I haven’t heard of this place. In Bicolandia, I’ve been to Legazpi, Sorsogon, Albay (seen the Volcano, covered with clouds), to a small town or village called Gubat… I was also in Bulusan. On my way to all these places, I could have spotted some indications of the place on the roads but I didn’t. Is it in the middle of nowhere? Hi Ross! Sorry for the late reply. I got so swamped with work. Yeah, it’s really photogenic but you have to experience riding the rafts to get the best vantage spots. It’s a short detour from the road.